We are pleased to announce the second release of KDE Telepathy. KDE Telepathy is a suite of applications which together form an instant-messaging client allowing you to talk on Jabber, Gmail, Facebookm, MSN and much more. 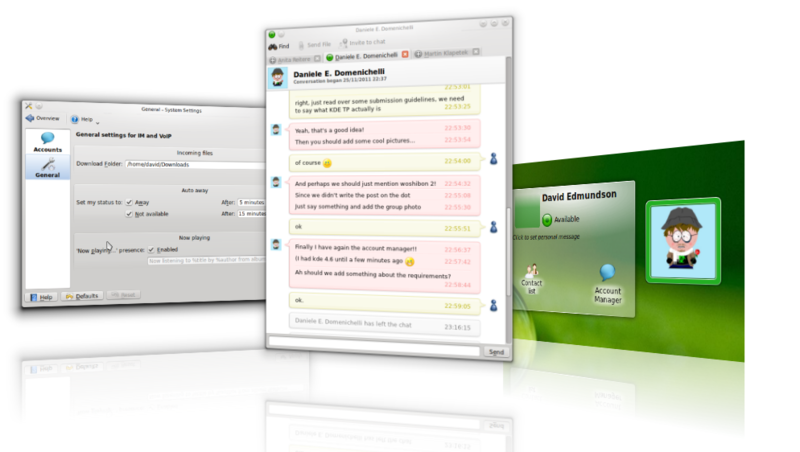 KDE Telepathy stands out from previous instant messaging clients by being able to integrate into the KDE workspace and plasma, as well as being able to be used like a traditional IM application. The whole team met at the Woshibon 2 sprint in Cambridge, UK (14th-18th September). This sprint was sponsored by both the KDE e.V and Collabora and allowed us to not only sort out many of the details in making this release, but planning out more long term goals as well. This is still a very early release and far from what we want to call the “finished product”, however all the functionality works and many of us now use it as a daily instant messaging client. In the future we shall have contact aggregation, audio and video calls as well as more plasma integration, and much more! We always appreciate the help from more developers, designers and testers; so if you are interested in helping please check out our wiki page at http://community.kde.org/Real-Time_Communication_and_Collaboration or join in IRC at #kde-telepathy on freenode. Be sure to check our wiki page for installation guidelines and troubleshooting help. Packages may be available for your distribution. I’m stepping down as manager for the 0.3 release. I have another project I want to work on as well as a tonne of uni work over the Christmas period. I’m handing over to the nearly as awesome Martin Klapetek to sort things out. We’re making the next magic release of KDE Telepathy next week, now would be the perfect time to help test and squash any final bugs before our second milestone release. Compilation instructions are available here. If you have any problems check the troubleshooting page, also I will be around most the weekend in #kde-telepathy if you have any further questions or difficulties. We are still very much in a development phase, there are still plenty of rough edges, and we are still not as feature complete as other IM clients out there. However things are vastly improved from 0.1. There are daily-build packages available for SuSE, but do not use the currently daily-builds from our Ubuntu PPA as they are currently broken and as such you will not be able to connect any account.